Australia. Sandy white beaches, picturesque mountain ranges and unique wildlife – even just from photos it’s obvious to see why it’s a traveller’s dream! Add on the fact we’re incredibly safe (96% of tourists were satisfied with personal safety) and incredibly friendly (94% of tourists were satisfied with the friendliness of locals), it’s understandable that we’ve had a 7.7% year on year increase for the last three years. In the year ending September 2017, Australia had 8.7 million tourists come to our shores. That’s nearly 40% of our population. Needless to say, we’re pretty popular. Out of these 8.7 million tourists, nearly 1.4 million of them are coming from China. Depending how you look at it, the dominant nationality behind Australia’s increasing number of international tourists may not be surprising. Chinese people have been coming down-under since the Gold Rush of 1850, searching for gold and opening food stores called “cookhouses” to serve Chinese diggers meals from their homeland. According to the ABC, one-third of all cooks in Australia were Chinese by 1890. Over a century later and Chinese restaurants still dominate modern home delivery apps like Deliveroo and Uber Eats. The fact is, China and its people have been an integral part of Australia for a long time and it’s certainly not changing any time soon. By 2026-27, the number of Chinese tourists visiting our golden shores is set to reach a whopping 3.9 million and inject over AUD$14 billion into Australia’s economy. In the last year alone, the number of Chinese tourists grew 12%, bringing AUD$10.3 billion with them. Not only is that over a quarter of Australia’s total tourist spend, but it’s an average spending of $7,770 per person – double the amount of our next biggest spenders from the UK. So what is Australia doing to accommodate? China’s middle-class is growing at a rapid rate and Malcom Turnbull’s government has built a prosperous relationship with China, so it’s no wonder that the 2017 Australian-China Year of Tourism was such a success. To manage and accommodate the future influx, Australia has improved infrastructure, expanded industries and up-skilled staff. This includes multi-lingual government websites and simplified Chinese digital signage at airports. 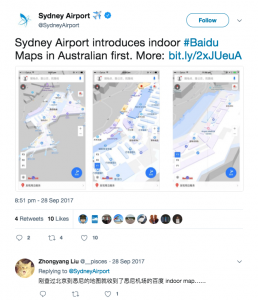 Sydney went a step further to become the first area outside of mainland China to introduce Baidu maps – a Chinese web mapping service with over 500 million users, used for street maps and route planning. The hotel industry is consequently growing too, adding a total of 14,000 luxury rooms across Sydney and Melbourne. Luxury shopping, being a major priority for Chinese tourists, has also been boosted. Precincts containing brands such as Gucci, Louis Vuitton, Chanel and Emporio Armani have been added to various locations throughout capital cities like Sydney Airport (where the Chinese spend three times as much in Duty Free as the average traveller), Melbourne’s Crown Casino and Brisbane’s Queen Plaza. In order to capitalise off these trends, Australian industries must adapt. One particular trend that China has influenced the world over is the trend of not carrying any cash and paying with your mobile phone. As of right now, 89% of China (pop. 1.37 billion) own a smartphone and 80% of these people use it to pay for nearly everything. The country’s trillion-dollar mobile payment market is dominated by two mobile wallets; Alipay and WeChat Pay, owned by Chinese web giants Alibaba and Tencent respectfully. Both of these mobile wallets utilise the QR-code as a method of payment and have almost completely ruled out the need to carry any cash – or a bank card – anywhere you go. In China, people can do things like pay their electricity bill, deliver food anywhere (including university class rooms), rent a bike, tap onto to public transport, or simply pay for a meal at the counter – all from their mobile phone. China is heading towards a totally cashless society. Even communities in rural areas and mountain villages have adopted Alipay and/or WeChat Pay. Homeless people on the streets have been seen to provide their own QR code so walkers by can donate money. In near-future China, there will be no other option but to pay with Alipay or WeChat Pay. 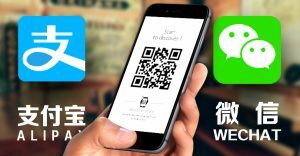 Alipay and WeChat Pay’s success has now started to move outside of mainland China. Both wallets are accepted in many countries all over the world, including Australia. Leading Australian retailers such as IGA, Chemist Warehouse, CUE Clothing Co. and Priceline now accept Alipay or WeChat Pay – or in some cases both. Accepting Alipay or WeChat Pay in Australia allows Chinese tourists or Australia’s large, Chinese student population to pay in-store using their local currency, such as the Chinese Yuan. In a recent study by Nielsen, 99% of Chinese tourists surveyed had either Alipay or WeChat Pay installed on their phone. When asked about their spending habits, 91% said that they would spend more if the shop accepted Alipay or WeChat Pay. As mentioned earlier, Chinese tourists spend almost three times more on shopping than any other traveller – this opens up a lot of opportunity for Australian merchants. As an Australian merchant, capitalising on the Chinese tourist boom is something you can get started on straight away. Traditionally (like China), Alipay or WeChat Pay will often give the merchant a QR code scanner in the form of a barcode reader or another EFTPOS-like terminal. You have to have one for Alipay and one for WeChat Pay. For a country like China, where almost all of payments will be through the consumer’s mobile, this is a perfect solution. For Australia, where merchants still need to accept cash and EFTPOS, debit and credit cards, having each QR code scanner, an EFTPOS Terminal and/or contactless card reader can get overcrowded and confusing – especially during peak service times. This gets even worse when it comes to reconciling the days takings from four completely different payment methods. Thanks to state-of-the-art EFTPOS software and innovative payment solutions, Safe2Pay has developed an integrated EFTPOS terminal that accepts Alipay and WeChat Pay, while also accepting all regular forms of payments including Visa/MasterCard, AMEX, Samsung Pay, Apple Pay and Google Pay. Safe2Pay’s integrated EFTPOS terminal produces both Alipay and WeChat Pay QR codes, allowing users to scan and pay using their mobile phone giving confidence and familiarity to each purchase. Safe2Pay has also included our patented tokenised payment technology (which uses a proxy number rather than the consumers real card details) to protect both the merchant and consumer from chargebacks and fraud. Not only does Safe2Pay’s integrated EFTPOS solution give you an all-in-one solution for accepting Alipay and WeChat Pay, but it gives you some of the best security and competitive transaction rates in the market.